Last year Joseph walked into a downtown emergency room with a persistent cough and trouble breathing. After a long wait he was examined by a doctor and was immediately admitted. He had a serious case of pneumonia that was getting worse by the day. After some testing Joseph was informed that he was living with HIV and that his body’s immune system had almost lost its ability to fight off infections. Joseph had AIDS and he was totally unaware of it. For those of us working in the Canadian HIV field, this is an all too common scenario. The reality is that out of all Canadians living with HIV, more than one in four don’t know they are living with it. And for those of us working with African, Caribbean and Black communities in Canada, it doesn’t surprise us to learn that Joseph is a Black man. People from African, Caribbean and Black communities in Canada are disproportionately affected by HIV and AIDS. They represent approximately 15% (one in seven) of people living with HIV in Canada while representing only 2.5% of the population. The national numbers also show that if you are Black in Canada, you are about 9 times more likely to become infected with HIV than other Canadians. Many people in our communities are unaware that they are living with HIV and that they may be passing it on to someone else. Often it is because they don’t feel that they are at risk and may not see the importance of getting a regular HIV test, or just are not interested in engaging in discussions about risks. Of course this isn’t just about individual choice, there are also broader social factors at play that make African, Caribbean and Black Canadians vulnerable to HIV such as poverty, racism, immigration status, language and communication styles, social support, as well as lack of adequate programs, policies, and curriculum. There is also the issue of stigma that makes it hard for individuals and communities to talk openly and honestly about HIV. The truth is that there are multiple factors that influence health outcomes and create differences in maintaining community health across Canada. Given this broader context, it is important to raise awareness about HIV, promote condom use and regular HIV testing, as well as to initiate conversations about HIV among Canada’s African, Caribbean and Black communities. This is a crisis in Canada’s Black communities and we need to get people talking about it. To address this, the Canadian HIV/AIDS Black, African and Caribbean Network (CHABAC) and its partners are launching the first ever African, Caribbean and Black Canadian HIV/AIDS Awareness Day on Saturday, February 7, 2015. This Day is important because we need to raise awareness of HIV, promote HIV prevention, and contribute to addressing HIV-related stigma in Canada’s African, Caribbean and Black communities. On this Day we are asking people to stop and reflect on our collective responsibility, as well as to fight the silence that so many in our communities want to maintain. Our goal is to build awareness so that people like Joseph can reduce their risk for HIV, get tested and get life-saving HIV treatments. 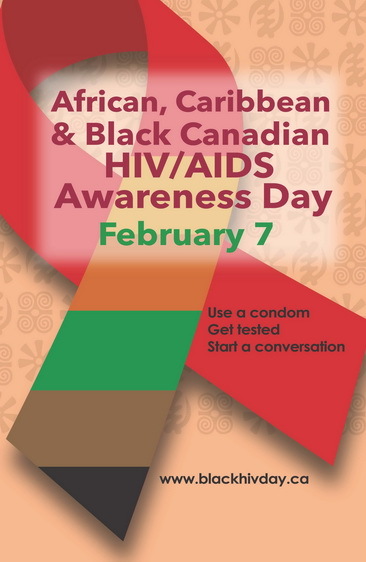 The theme of the first African, Caribbean and Black Canadian HIV/AIDS Awareness Day is Use a Condom, Get Tested, Start a Conversation. So what happened to Joseph? After getting treated for pneumonia, he left the hospital and sought care for his HIV. He started a treatment regimen that virtually eliminated HIV from his body and he is now successfully living with HIV and leading a healthy and productive life. This entry was posted in English and tagged African Caribbean and Black Communities, Aids, Canada, Canadian HIV/AIDS Black African and Caribbean Network (CHABAC), HIV by kiumars. Bookmark the permalink.